Paper • ISBN-13: 9781560256465 • US $15.95 • 8.3 in x 5.6 in • 473 pgs. A critically acclaimed novel that explores fifty years of Cuban-American relations. Set in Miami in 1981, Los Gusanos is the vivid and moving account of one extended family’s life in Cuban and the United States. With pathos and understanding, Sayles introduces us to a memorable range of characters — young, old, black, and white — all of whom are struggling to make a new life in their adopted country while haunted by the memories of Cuba. 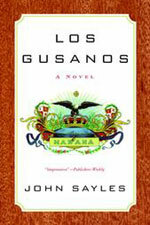 Taking as its title the derogatory term Castro used to describe those who fled to Miami after he came to power, Los Gusanos is beautifully rendered study of who will be the casualty and who the survivor in a time of political upheaval. John Sayles works as a fiction writer, screenwriter, actor and feature film director. His novel Union Dues (1978) was nominated for the National Book Award and the National Critics’ Circle Award. He has written over a hundred screenplays and was twice nominated for the Academy Award for Best Original Screenplay. He has directed 18 feature films, with another, I Passed This Way, currently in progress. His films Matewan and Lone Star, as well as his previous novel A Moment in the Sun, are often used for instruction in History and American Studies courses.